Click any panel heading below to open it. Then click a title for further information about the score or click Buy to go straight to our shop. GRANDJANY, MARCEL (b. September 3, 1891, Paris, France. d. February 24, 1975, New York City). 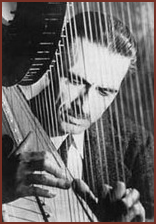 American harpist of French birth. He studied with Henriette Renie, then gained a premiere prix in 1905 at the Paris Conservatoire, making his debut with the Concerts Lamoureaux Orchestra and giving his first recital at the Salle Erard when he was 17. He was also an organist, and played at the Sacre-Coeur Basilica for several years during World War I. Thenceforth he devoted himself to the harp, making his London debut in 1922 and his New York debut in 1924. He settled in New York in 1936 and became an American citizen in 1945. He taught at the Juliard School from 1938 until a few weeks before his death, and at the Montreal Conservatory from 1943 to 1963. Apart from his faultless technique, the outstanding merit of Grandjany's playing was the sheer sensuous beauty of the sound he produced with his rather unusual spatula-shaped fingertips. His influence as a teacher was immense, and his many solo and ensemble harp compositions are attractive, and extremely well written for the instrument. We have other Marcel Grandjany music in stock and about to be added to this site.